Honey bees are species of bees belonging to the taxonomic genus Apis, which are best known for their use in creating honey. The honey bee is a cold-blooded animal, however their bee hive temperature is always kept the same temperature. Specially, larva and pupa's growing area is always keep 32~35 degrees celsius. During the summer, temperature goes up high, worker bees bring water from outside and apply water on surface of the hive, so cold air will come inside of the hive, then make the inside of house's temperature go down. 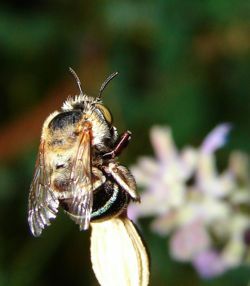 And when they need the temperature higher, the worker bee will not use their wing, vibrate their thorax muscles. This helps honey bee's hive temperature to go up. However, the honey bee will stop work when temperature is less then 21 degrees celsius. 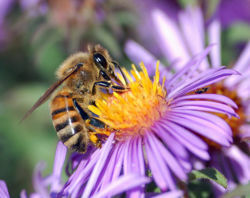 The honey bee is not good at sense of sight, and use the antenna for smell. 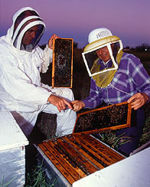 Bee keepers examine honey bee colony. Apis by Myers, P., R. Espinosa, C. S. Parr, T. Jones, G. S. Hammond, and T. A. Dewey. 2006. The Animal Diversity Web. Anatomy of Worker Honey Bee by Bee Buzz for Kids. Apiculture Factsheet #104: The Honeybee Colony by the B.C. Ministry of Agriculture and Lands. This page was last modified on 14 July 2009, at 13:35.